Bigger and Better: PHX Night Market Food and Music Festival Takes Over Downtown Phoenix April 21-22 - Downtown Phoenix Inc.
After its blowout inaugural success last year, PHX Night Market is back—and stronger than ever. The Arizona Asian Chamber of Commerce (a community nonprofit organization) in collaboration with Incredibly Hungry LLC and PHX Night Market LLC is bringing PHX Night Market: Neon Edition to Downtown Phoenix April 20-21. Last year’s event anticipated 5,000 attendees over two days, but exceeded expectations when 12,000 to 13,000 people arrived to experience one of the first Asian-inspired food night markets in Arizona. This year, PHX Night Market is taking over the streets of Downtown Phoenix near Jackson Street and Central Avenue, an area once known as Chinatown from the late 1870s to 1940s. This history will be integrated into the festival through 3D art projections by Gestalt Theory on the Sun Mercantile building, the last building remaining from the historic Chinatown period. The 2019 PHX Night Market will feature 75-plus local and out-of-state food and retail vendors, all unveiling a limited-edition menu or product item specifically for the attendees of the Night Market. New this year is the lineup of musical guests including a meet and greet with Wild N Out and Send Foodz rapper Timothy Delaghetto. Other musical artists include Justin Park, NOSAJ Thing, MIKNNA, Nu Flavor, and more. In addition to food, music and shopping, festival attendees will get to enjoy arcade games, live mural art by Paint PHX, and a kids zone with a playground installation and character appearances from Baby Shark and Pikachu & Friends. For guests wanting an elevated experience, PHX Night Market is offering VIP tickets where guests can enjoy an exclusive “Crazy Rich Asian-style” lounge complete with a champagne and beer open bar, a dim sum experience, live music from Japanese rock band Surfing Godzillas, and early entry into the Night Market. 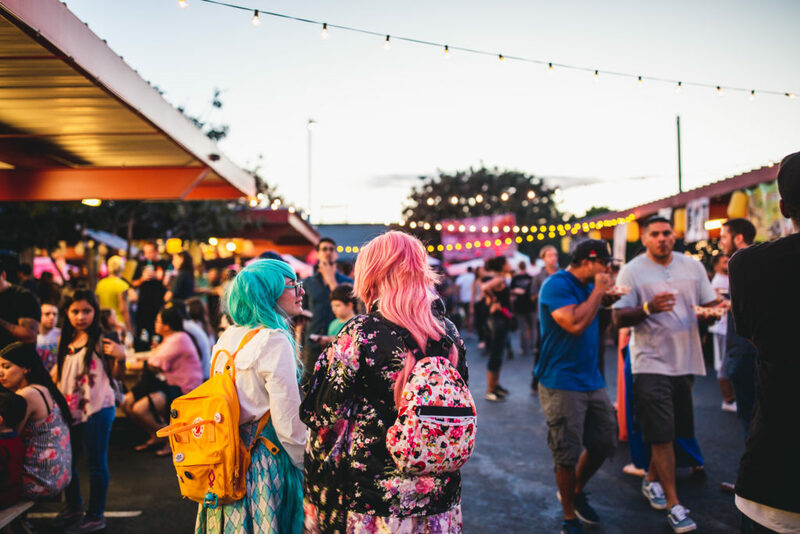 PHX Night Market is family-friendly, cosplay-friendly, and is open to all individuals, foodies, and music lovers alike. General admission, General Plus, and VIP tickets are now available online at phxnightmarket.com. Date: The PHX Night Market is a two-day outdoor festival Saturday, April 20 and Sunday, April 21, 2019 from 6 p.m. to 10 p.m. Event location: Along Jackson Street between Central Avenue and Fourth Street, behind Talking Stick Resort Arena. Tickets: General Admission Tickets are $25 advance and $30 at the door. For those who want to beat the lines, one-hour early entry tickets are available online only for $35. The festival is free for kids ages 5 and under and kids ages 6-12 are $5. VIP tickets are available online for $125. Only GA Ticket types will be available at the door at limited quantities.